Apeks has developed unique 1st stages specifically for use on a twin set. The new Apeks TEK3 1st stage regulators are designed for use with twin cylinder configurations. The system benefits from streamlined hoses with little chance of accidental snagging and also improved ease of access to cylinder valves. Each 1st stage has 3 medium pressure ports and one high pressure port. They are balanced, cold water compatible and extremely robust. The Apeks TEK3 Regulator Set looks great too. 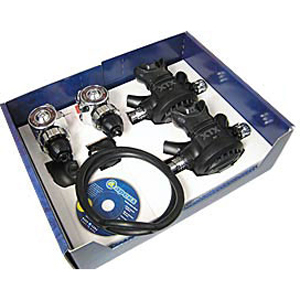 The regulator can be purchased individually in both a left hand and right hand version, or together as a pair, to fit both posts of your twinset for optimum hose routing. The Apeks TEK3 can be purchased individually as a left or right hand version or together as a pair. Usually you will find it is cheaper to buy them as a pair. The Apeks TEK3 1st stages have been designed and tested for use with any Apeks cold water spec second stages. The choice is yours. We are sure this is a leap forward for extended range diving, wreck diving, cave diving, in fact any diving where twinset use is preferred. The Apeks TEK3 Regular Set is available only in a DIN version. Compatible with EAN40 when new, out of the box. Outstanding cold water performance.